If you like a lot of dog in a fairly small package, Scottish Terriers are definitely a breed worth checking out. Scottish Terriers are one of those iconic dogs that nearly everyone recognizes even if they don't really know much about the breed. Scotties, as they are affectionately known, hail from Scotland as their name implies. The breed is quite old, with some of the earliest mentions cited in the fifteenth century. It's not exactly clear what the forerunner of the Scotty was, but it's believed that the breed shares a common ancestry with Dandi Dinmont, Cairn, Skye and West Highland White Terriers. Origins aside, the breed was specifically developed to hunt down rodents and other vermin. To that effect, these dogs were selected for a tenacious attitude that would drive them to succeed at the task at hand. Naturally, they are quite adept at digging, a trait that remains with the breed to this day. Sturdy and agile are the best words to describe Scottish Terriers. The size of these dogs belies their real strength. The Scotty may seem small, but pick one up and you'll quickly lose any misconception that these dogs are Toys. Scotties are naturally longer than they are tall, and they have the standard "Terrier type" head. As with so many Terrier breeds, the teeth are quite large when the lips are pulled back. The neck is fairly slender and blends nicely into muscular shoulders. The tail is strong, short and set fairly high. Scotties are low and compact. The average height is just under twelve inches at the shoulder, while weight ranges around twenty pounds, give or take a few pounds. Males are slightly stockier than females. 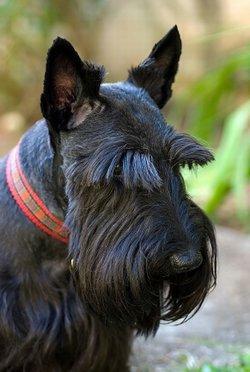 The black Scotty is so well known that it is hard to believe the breed comes in any other color. However, Scottish Terriers may also be a soft wheaten or even brindle color. Scottish Terriers do take some grooming to keep in good shape. Their harsh outer coat is insulated underneath with a thick, soft undercoat that requires brushing several times a week. Thankfully, shedding is at a minimum with this breed, and a trip to the groomer's for a professional trimming about every six months is generally enough to keep them looking respectable. They can be bathed as needed, with special attention paid to keeping their nails trimmed if they don't get enough exercise to wear them down. The Scottie's temperament and standard training methods must be considered together as a package deal. As Terriers, these dogs have a strong independent nature, and they will rule the household if you don't establish a proper family hierarchy from an early age. That said, few dogs make as interesting companions as Scottish Terriers. They are a wonderful mix of bravery and heart, affection and independence. They are quite lively as puppies, but they do settle down as adults and become remarkably dignified. They love a good romp or game of catch, but although they are an active breed, they do not require tons of exercise. A good daily walk will suffice to help them burn off excess energy and stimulate their inquisitive little minds. Keeping the breed's basic temperament in mind, training must begin from an early age. Begin with puppy classes and move on to obedience training as soon as the dog is old enough. Scotties need structure and boundaries in order to become the best companions they can be. This is a very smart breed, but these dogs do resent a heavy hand. They will not respond to training if they are handled harshly. Being consistent in your expectations and rewarding for positive behaviors are the keys to helping your pet understand what you want from him. It should be stated that, overall, Scotties are not necessarily all around family companions the way some breeds are. They are congenial to a point, but they are not the most patient dogs in the world. They do well with adults and older children, but they can become a bit snappish with younger children or anyone else they think they can dominate. Again, early training is the key to developing the best possible personality in your pet. By and large, Scottish Terriers are long-lived, generally surviving a good twelve years or more. That said, the breed does face some health problems that prospective owners should be aware of. Von Willebrand's disease: This is a blood disorder that interferes with the blood's ability to clot. It is similar to hemophilia in humans, but not quite as severe. Scottie cramp: Seemingly unique to the Scotty breed, this condition causes the dog's muscles to seize up and cause awkward movement. The condition appears to be triggered by stress, and subsides once the dog calms down and relaxes. It should be noted that this condition is in no way related to seizures, and the dogs suffer no ill after affects from an episode. Craniomandibular osteopathy: Commonly referred to as "mouth problems", this condition is marked by an overgrowth of the lower jaw and usually presents as jaw pain. The condition typically appears in puppies around six months of age. Skin allergies: These can be related to low thyroid activity as well as a hypersensitivity to flea bites. Cushing's Disease in Dogs: An over production of the hormone cortisol causes a wide variety of symptoms that make the overall disease difficult to diagnose. Scotties are worthy companions to those bold enough to share their lives with them, but this is not the breed for everyone. Carefully consider the make up of your current household, as well as how much time you can devote to training before you make the decision to bring a Scotty into your world. Visit the Scottish Terrier Club of America for a wealth of information on the breed as well rescue info.